Pulling out a chimney today…over the kitchen. Long ago it was taken down to the roofline. The mortar they used then was just lime and sand…it tends to lose the lime over the years and just turn to powder. About 8 feet of this in the attic…I’ve pulled down about 6 feet of it so far. 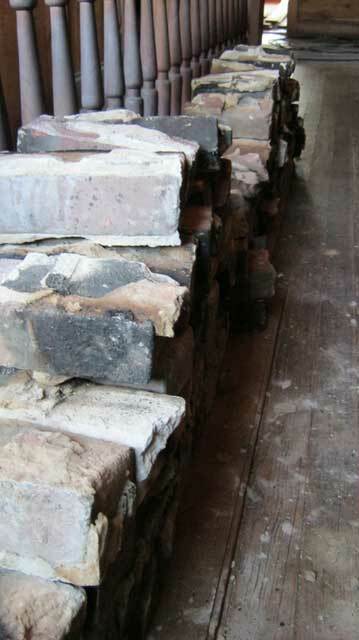 The brick itself appears handmade and is not in great condition. Some of it is very crumbly. It’s time for this mess to go, as it makes more room in the kitchen and it structurally questionable. After I finish I can do the long awaited kitchen wiring and ceiling insulation. Being on the north side, and with beadboard walls and ceiling, the kitchen is the coldest room in the house in the winter, and definitely the warmest room in the house in the summer. There was no real point in insulating it until I got this done or I would have a mess to clean up, and it would have been much more difficult to climb around the insulation. Since I want to salvage some of the brick to patch the old vents in The Cupola building (another story) and possibly to line a garden or a path or such, I can’t just toss them out a window or they would break. Sooo…the hard part of the project. All the brick in the attic will have to be carried down the stairs, down the hall, out the door, and across the deck. I’ve been getting ahead of the brick carriers…all three of them! Yeah. That would be me, myself, and I. Of course, once I get below the kitchen ceiling I don’t have to carry them down the stairs anymore…just out the kitchen door! 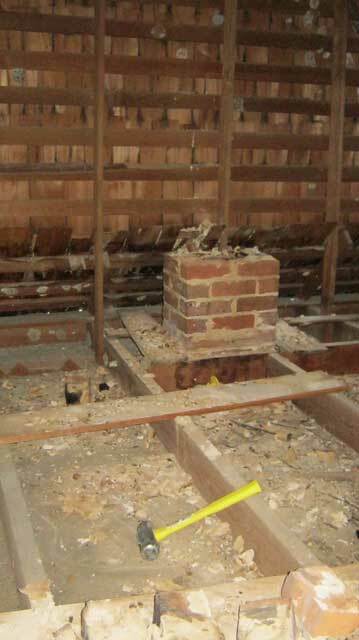 Oh, and apparently slinging a sledge hammer and hefting bricks in the confined spaces of an attic is good for you…carrying bricks and buckets up and down stairs too…ya know…exercise!